Oops - we don't appear to have a video for the SmartOffice PL2546. Digital Documents Solutions for Distributed and Central Offices. The Plustek SmartOffice PL2546 is great idealistic for Government departments, institutions, enterprises, organizations and distributed branch offices use to go paperless. Documents scanning, editing, filing and archive management can be simplified by using this scanner. With the functionality of duplex ADF and flatbed scanner, it is really easy to handle a lot of documents scanning and capture any size of documents for digital filing and management. 50 pages ADF feeder capacity are helpful to enhance work efficiency. The scan speed of 25ppm/46ipm and hi-resolution scanning results make it well suit for central and distributed branch offices. Features OCR, A3-Size Documents & Plastic Cards Colour Duplex Scanning. Let the Plustek SmartOffice PL2546 competes for your business! 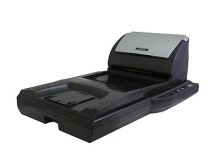 This scanner features full color duplex scanning of "thick documents" and "plastic card", such as insurance cards, credit cards, ID card and drivers licenses. With the Plustek advanced CIS sensor technology, flatbed up to 1200 x 1200dpi optical resolution, it is suitable for hi-resolution photo scanning. Improved color accuracy enhances images for much truer and more consistent colors. Hi-recognition OCR scanning results and A3-size document support make it simplify all your daily work, especially well suits for the centralized digital database sharing to distributed branch offices and workgroup users. Specific Design: Convenient Single-Touch Function Buttons. With the Single-Touch Function buttons design, the Plustek SmartOffice PL2546 enables easy scanning of typical office documents. With the features of auto-size, auto-crop and auto-deskew, all documents can be easily digitalized for you to store, reorganize, edit, and also sharing with workgroup instantly. The functions allow you to directly scan to searchable PDF, OCR and BCR, and also access programs seamlessly, such as Excel, Word, Email, Copy and Save to File directly. Just once touch let all documents scan complete with ease, and you can also customize each button for your specific need. All of the versatile features help productivity increase and enhance work performance, especially the need to digital document archiving and management.